Wow...goes to show you that our ancestors were quite clever. That rachet system looks to be quite ingenious. Wow That was one REALLY hard dude. Yeah, this guy should be given a round of applause for his manliness. It cetainly would be handy. It would be interesting to see a reproduction of it made, and better yet used! But I guess they'd need a hand to put it on. But hey, it's armless to try new things. I have a friend down south who is missing most of his left arm below the elbow. He would really dig something like this. He currently fights with both spear and sword using a special leather prosthetic that a armourer local to him made. To make something like this that is functional and robust enough to hold a mace means a good deal of design talent as well as being able to make very close tolerances and gears with regular teeth: You can't have too much variation from gear tooth to gear tooth on the matching gears otherwise it would lock up or jambs. I would think that a clock maker would have the skills and knowledge of geometry/math to figure out how to make such a hand work but only someone very rich could afford to have one made. Ha. Totally beat me to it. I just had a wow moment of my own stupidity at times. I'm more or less a lurker here, but I'm trying to write a historical fiction based on Götz's life. The 'duh' moment came from realizing I hadn't asked anyone here if they knew where I could find a full translation of Götz's memoirs. I found a partial translation which actually made me stop writing for want of a full translation due to the wealth of detail it contained. I'd like to keep my book as true to life as I can while making it interesting to read. It shouldn't be too hard considering the subject. Any help would be outstanding! I love Götz too, tell us when your book is finished ! Yeah... I bought this, and it's in German and completely unhelpful. Maybe I just need to learn MHG. =P The search continues until then. Not a big deal, I needed one in German anyway. It will help me learn German so I can read fechtbuchs. I thought it was in English too (obviously), so no worries. There's a preface and commentary in English in the beginning, but that's it. Makes me wonder how much technology has been lost or undiscovered. Our ancesters were as intelligent as us and had time at there disposal as well, time was cheap back then. On a tangent, is there not an old Irish legend of a king who lost his hand and had it replaced with a lifelike silver one ? The name Nuada springs to mind, perhaps there could be an element of truth behind the story after all ? Indeed. And you'd be surprised how far back prosthesis dates (I know I was). For instance a wooden foot prosthesis dating back to the Egyptians was discovered... Not as complex as these mechanical hands, but already well-made. We all have that idea that "back then" they were barely able to replace a leg with a wooden peg or a hand with a hook... Not so. Instances of "lost technology" are also indeed probably more numerous than we usually think... For instance, the Romans developed a concrete with which they built huge buildings including the Pantheon in Rome, still the largest concrete dome today. That technique was then apparently lost and it is only at the end of the 18th century that similar concretes were developed. Apparently Roman cement is even better (i.e. more resilient) than many types of modern cements who degrade far quicker. I notice that "damascus steel" is listed as a technology that has never been perfectly reproduced... This strikes me as odd, but I'm not much knowledgeable on damascus (and know better than to engage in the debate "what is damascus steel exactly?"). I believe I saw a prosthetic metal arm at Burg Hornberg in Germany. I was only 11, so I can't remember if the actual arm was on display or if it was just that the knight who owned the castle had a metal arm. edit: Upon further research, it was the castle of Gotz von Berlichingen, the very subject of the thread. Go figure! ...perhaps there's a nugget of fact in the phrase, "he ruled them with an iron fist." Perhaps a king or two had these very types of prosthesis. W. H. Reed, NAS, NAA. 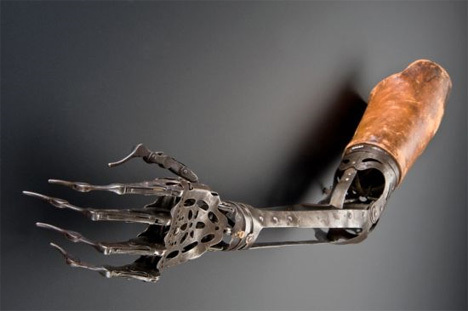 In the late 17th c. New France, Henri de Tonti had an artificial hand, probably of brass. I used it at times to punch opponents. He was nicknamed Iron Fist. Just imagine Gotz von Berlich and Jaime Lannister giving each other a fistbump... I am pretty sure the result would be the start of a new universe.. I actually sent this to GRRM back when this thread was new and got a reply! I always found these earlier period mechanisms fascinating. So many people have an image of peoples of the past being without any kind of technical know-how and any time these come up it makes me happy to take down that stereotype.